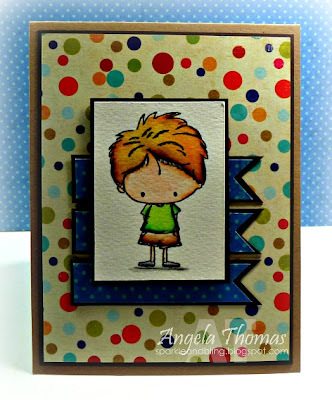 This week at Stamping Bella, it's all about the boys!! I'll admit, I don't often do "boy" cards but I knew that Arthur from the set called "Arthur and Annie" would be perfect. It's unfortunately sold out right now... Darn... I stamped him in Versafine Onyx Black, embossed with clear embossing powder and then watercolored with Tombow Markers. The layout is a recent "Retro Sketch" that I flipped on its' side. 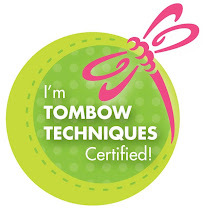 Ready to play along with the next Stamping Bella challenge? Next week's challenge is a sketch challenge! 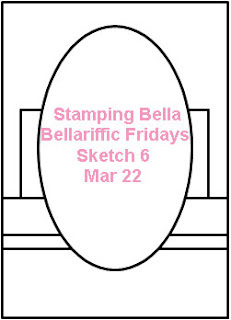 Email Emily (emily@stampingbella.com ) with your entries by the end of Thursday, March 21st to see your project on the blogabella and to be eligible to win $10 Bella Bucks to the Stamping Bella Store!! I LOVE the bright colours of this and the layout is fab - love that trio of banners!